JOHN RUSIN OF Cobblers, center, attempts to outrun TEK pitcher, Frankie DiCostanzo, left, after getting caught in a rundown between first base and second base in the first inning of Wednesday nights game. DiCostanzo tagged out Rusin on the play. 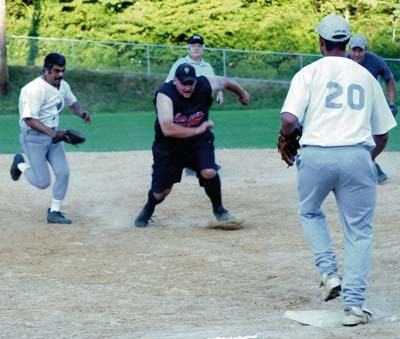 LIBERTY  August 11, 2006  Cobblers Bombers defeated Mongaup Technology (TEK), 15-6, on Wednesday night in a Liberty Slo-Pitch Softball League A Division game at the Liberty Elementary School field. The game started off slow, but ended with jolts of powerful hits from Cobblers. In the top of the first, Cobblers Keith Shaddock started off the contest with a double to right field. Moments later, Shaddock scored on a single by John Rusin. But Rusin got himself caught in a rundown between first base and second base. TEK pitcher Frankie DiConstanzio tagged Rusin out as he was heading back to first base. In the bottom of the first, TEKs Louie DiConstanzio was walked and then Bill Danchak hit a home run. Danchaks blast gave TEK a 2-1 lead. Cobblers defense tightened up and prevented TEK from scoring any more runs in the frame. The first two Cobblers batters in the top of the second, Will Smith and Steve Vlaovich, each hit a home run. The two round-trippers allowed Cobblers to retake the lead, 3-2. TEK held together and got the next three batters out to end the inning. After holding TEK scoreless in the bottom of the second, Cobblers added to its lead in the top of the third. Rusin smacked an RBI single to right field to give Cobblers a 4-2 advantage. TEK answered with a run in the bottom of the third. Kevin Brockner crossed home plate on a double by Pat Clifford. With one out in the top of the fourth, Will Merchant of Cobblers hit a triple. He scored moments later when Shane Conner singled, which gave Cobblers a 5-3 lead. TEK took the lead in the bottom of the frame, however. With the bases loaded and one out, John Harting hit a single to bring home teammates Gary Davitt and Bill Danchak. Brockner then hit a single to score Doug Johnson, which gave TEK a 6-5 advantage. The score remained 6-5 in favor of TEK until the sixth inning. Cobblers regained the lead by scoring twice in the top of the sixth. Jason Legenos ripped a triple to right field. Rusin slammed a two-run homer to give Cobblers a 7-6 lead. Smith and Vlaovich hit back-to-back singles to keep the inning going. Smith scored moments later on an error. Cobblers held TEK scoreless in the bottom of the sixth before adding some insurance runs in the top of the seventh. Sam Millheiser started the inning off with a single and Matt Stoddard followed with a single of his own. Shaddock hit a double, which allowed Millheiser to score. Rusin then walked to load the bases. Stoddard and Shaddock crossed the plate on a double by Mark Logan to extend the Cobblers lead to 10-6. Smith hit a single, scoring Rusin and Logan. Smith crossed the plate on a triple by Vlaovich. Merchant hit a ground-rule double, which allowed Vlaovich to score the games final run. With the victory, Cobblers improved its record to 21-2. The team has two games left in the regular season and is currently in second place in the leagues A Division. TEK fell to 12-11 on the season. The team is in sixth place in the A Division.